The student and studentwd tables are the tables that hold student information and are identical in structure. The studentwd table holds withdrawn students. When the student withdraws, their record is moved from the student to the studentwd table. In the event of re-enrollment, the record is just moved back into the student table. The studentall table is a virtual table that is the joining of the two student tables. It is effectively a view but in MySQL 4.x, this is called a merge table. The studnum field uniquely identifies the student. Within a school division blocks of student number are assigned to each school to keep the student number (studnum) unique within the division. For individual stand alone schools, this is not an issue. It starts a 100 by default. The transfer table stores enrollment change information. Every time a student enrolls or withdraws from the school, one record is added to the table. The staff table) is used to identify the teachers, TA/EA's (teacher aides or educational assistants), and other teaching staff members. Each person is uniquely identified by their userid field. Each person should have this field entered. The homeroom field will match the homeroom field in the student records. The doatt (Do Attendance) field indicates which teachers do attendance (and are tracked for entry of daily attendance). The certif field holds the teaching certification number for use with the Saskatchewan SDS system. (or other provincial or state based numbering system). emailgroup.pl, emailgroupSM.pl - email messages to groups of parents and/or students. The SM version uses the Sendmail interface if you have an internal email server. labels.pl - label printing script with a variety of formats and layouts. Also runs from teacher site. rptbillet.pl - report on locations where children stay in the result of bad weather and other situations where they cannot be transported home. rptbirthday.pl - birthday report with a variety of options. Replaces the previous 2 separte reports. rptcustomclasslist.pl - A highly customizable report to print student lists for various types of recording. Choose between grade or homeroom, column widths, etc. rptcustomstafflist.pl - A similar report with many output options for printing staff lists. rptdemoconf.pl - Demographic confirmation report. Based on a template. It is normally printed to be sent home and signed by parents to confirm student information. rptenrolmon.pl - monthly enrollment change report with breakdowns by ethnic categories. rptethnic.pl - report ethnic numbers by grade. rptfamily.pl - family grouping report based on phone number. Will be replaced by a better solution when demographics system is redesigned. rpthouseleague.pl - house league (intramural teams) listing of student membership by homeroom. rptmedical.pl - a medical report that will do text searches in the medical field. New upcoming versions will have better reporting along with a new medical subsystem. rptphone.pl - a simple web based form to list student phoning information. rptreligion.pl - student report showing student religion by grade. rptrelsacra.pl - a religious sacraments report showing religion fields for students. rptreserve.pl - a report listing students and their home reserve if field is filled in. rptstudrost.pl - a pdf report listing complete student demographic information (one or two records per page). It is based on a template and is extensible. rptsumage.pl - a report that gives age and gender breakdowns in the classes and grades. rptsumenrol.pl - summary school enrollments by grade. rptsumethnic.pl - report on summary ethnic origins of students by grade. rptsumrel.pl - a summary religion report by grade. rpttransmon.pl - a monthly enrollment change report (transfers are enrollment changes and are stored in the transfer table). rptyoungest.pl - a report listing those students who are indicated to be the youngest in their family. This is useful since letters home to parents are frequently sent with the youngest. staffpopmulti.pl - temporary script to convert the staff table to the new multi-table format (version 4.75) . To be Removed in later versions. studed.pl - a script that allows editing of student demographic information. It uses a template from the templates directory (and is customizable as a result). studeled.pl - a report of all students in all student tables - current, withdrawn or preregistered/waiting list. It then links to studed.pl to allow editing of student information. It doesn't allow deletion of students since this requires a withdrawal. studsearch.pl - a student search function to search demographic records by number, name or initials. I like initials the best. studview.pl - a templated full demographic record view of student demographic information. When students withdraw, they are moved from one table (student) to another (studentwd) When they re-enrol, they are moved back. A transfer table keeps track of all of these movements and all new enrollments, etc. globenrol.pl - called by student enrollment script (sentry0.pl). Copy demographics data, etc. from other school into local records. globview.pl - show withdrawn students in entire division. reenrol.pl - called by student enrollment script (sentry0.pl). Move student from withdrawn table (studentwd) into active student table (student). sentry0.pl, sentry1.pl, sentry2.pl - Student Enrollment Script; sentry0.pl - describes direction of student record flow (withdraw, enrol, re-enrol from withdrawn or global). transadd0.pl, transadd1.pl - Add a new transfer record; a blind script not called from anywhere. It would need to be entered from location bar in browser to run. transchk.pl - check transfer records for internal consistency, etc. Many checks done. transview.pl - View transfer records; called from main page. waitxfer.pl - place students onto the waiting list. withdraw.pl - withdraw a student from school. Move his/her records to the withdrawn student table (studentwd). Called by the starting student enrollment script (sentry0.pl). confview.pl - view all configuration files for the school. 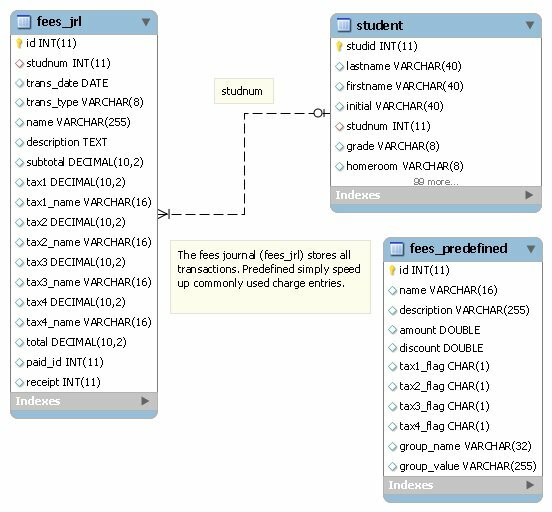 permdel.pl - permanent deletion of student data (except values in transcript (course results) and transfer (enrol/withdraw) tables, which are long term storage). This includes their demographics record in studentwd (withdrawn student) table and also evaluation, discpline, and attendance. pwdfix.pl - fix any passwords with trailing cr/lf values. Not called anywhere; blind url. 2007 script. resetgrade.pl - reset all student grade fields. resethroom.pl - reset all student homeroom fields. resetselect.pl - reset any selected student field. Very useful. withdrawprom.pl - Withdrawn promoted students. The attend table stores student attendance. There is one record for every period that a student misses. The student is identified by the studentid (aka studnum fields in other tables) field. This information is used to link together large numbers of tables. The absdate (absent date) and period field identify when the miss occurred. The reason and late fields indicate the reasons for absence to help categorize the records. The subjsec field identifies the subject / section (subjsec) missed for subject based attendance. This field is normally not used in elementary schools. The late field is not used by any functions, yet. The id field (called attid in this table; a design mistake) is used to uniquely identify each record to allow them to be edited or deleted in the event of an entry mistake. This id field is used in most other tables also, for the same reasons. The tattend table is used to track teacher attendance entry. Every time a teacher enters attendance on the teacher site, a record is stored in this table. This will allow central office to ensure that every teacher has entered his/her attendance (even if perfect attendance) so that absences can be tallied, etc. This is necessary since OA only tracks ``absences'', not ``presences''. In many schools, this is not required. attaddall.pl - Main attendance entry method for secretaries. Will do all grades, by homeroom or subject. attcheck.pl - checks attendance records for duplicate records, blank reasons and dates. It allows for fixing the errors also. attdel.pl - delete attendance record. Linked via the attdeled.pl which is a main menu script. attdeled.pl - display a list of attendance records, and then allow them to be edited or deleted. (via the attdel or atted scripts). atted.pl - edit attendance record. Linked via the attdeled.pl script. attentrymd0.pl - multiple day (md) attendance entry. Select weekly/biweekly, student groups, and periods. attentrymd1.pl - multiple day (md) attendance entry. Reason selection. attentrymd2.pl - multiple day (md) attendance entry. This stores the information in the attendance table (called attend). attethview.pl - view attendance by ethnic category. A summary report. attpwrdel.pl - attendance power delete. Allows rapid removal of attendance entered by mistake. attrsnreset.pl - reset the reason for an attendance record. The displayed reasons are for a particular date. attscan.pl - a large script to scan for students with attendance problems that will trigger discipline events. The settings in etc/admin.conf control the triggering of particular discipline events based on accumulated attendance points. A particular attendance event is assigned a particular point value. It will automatically add those discipline events and also generate PDF form letters for mailing home. The form letters template is in the forms directory. attscanview.pl - related to the attscan script above. It is passed a subject-section or a student number and will display the attendance record for those students along with their current attendance points values. A certain number of points will generate a discpline event. attview.pl - View attendance records. View by student or class. chkattend.pl - A script to check for teacher attendance entry (ie. that they've done their attendance). chkstuatt.pl - Check student attendance for those exceeding a certain number of days (input by user). Weakness is that it relies on embedded 'Absent Unexcused'. rptattdaily.pl - Daily attendance report with full stats at end, etc. rptattmonth.pl - Monthly attendance report. rptattperf.pl - Perfect attendance report. Find all students that have perfect attendance. Settings in the admin.conf file can allow certain attendance records to be ignored (ie. lates) depending on school policy. rptattphone.pl - A report to display phoning information for students absent/late for the day. Normally used by attendance officers, etc. rptattprof.pl - Attendance Profiles Report. A report to do simple attendance calculations and reports on all attendnace records. This is normally used by schools that are not yet using report cards (which contain attendance information also). rptattstudsubj.pl - A cumulative report for the current term for each student by subjects. rptattsubj.pl - Attendance report by subject. rptcohort.pl - Analysis of cohorts in terms of students at start of year compared to the same group at the end of the year. rptinac.pl - INAC (Indian Northern Affairs Canada) attendance report. Basically a monthly attendance report. The infraction table which stores the descriptive text for the different kinds of discipline events in the school. The discipline table stores the discipline infractions for the students. There is one record for each infraction. 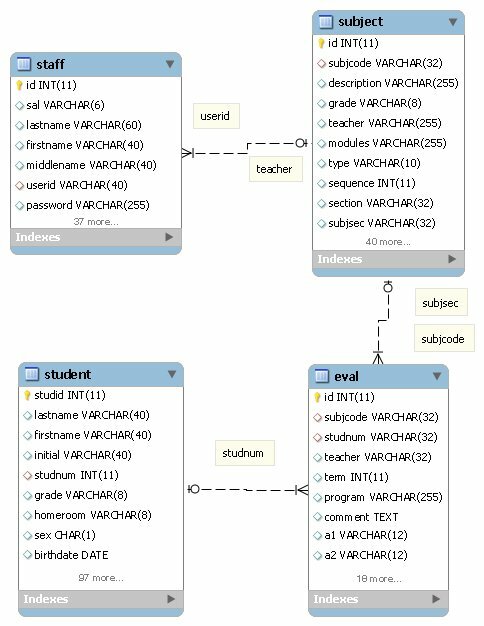 The userid field is the student number field (studnum). The author field is the userid for a staff member. The private field is used to mark records only visible from the admin site, not the teacher site. The parent field indicates the nature of parental notification about the event. The action field indicates any action take due to the event, and the repeat field is the nature of the consequence in the event of a repeat of this behavior. discadd0.pl,discadd1.pl, discadd2.pl - Scripts to add discipline events. discbulkdel0.pl, discbulkdel1.pl - delete records by date and/or student. discdatedel.pl - delete records by date. infvw.pl - View current infraction categories. rptdiscstat.pl - Summary report with statistics. This system is used to track student fees owing, and notify parents of amounts owing. The fees_jrl is the main fees journal table and holds all transactions. id int(11) not null auto_increment - the normal id field to identify this record. studnum int(11) default null - the student number field. This field identifies the student that this transaction applies to. This links to the student number (studnum) field in the student table. trans_date date default null - the transaction date. Scripts allow the user to change the date (if doing entries after the fact). They are not forced to make this todays date. chg - for a normal charge transaction where a student is charged a particular fee. pay - a payment for a single charge or several charges. roa - received on account for a payment where there is an overpayment or there is not sufficient payment to pay a change transaction completely. There is more below on the nature of these transactions. name varchar(255) default null - a short name describing this transaction such as School Uniforms, Book Fees. description text - a full unlimited length text description of the transaction (normally only possibly required for the charge transactions). subtotal decimal(10,2) default null - the value of the transaction before taxes. It is left null for payments and received on account (roa) transactions since there are no tax values. tax1 decimal(10,2) default null - the value of a particular tax. These tax names and their rates are set in the fees.conf configuration value. 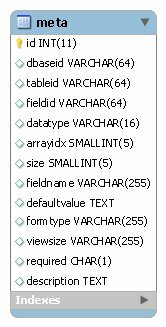 tax1_name varchar(16) default null - the name of the tax as set in the fees.conf configuration file. tax4_name varchar(16) default null - same as the tax 1 values. OA has room for up to 4 taxes which seems to be the largest worst case scenario. total decimal(10,2) default null - the total value of the transaction including all taxes (the sum of the subtotal and tax1 to tax4 if present). For pay and roa transactions there are no taxes and only this field is used to store the value of the transaction. The subtotal field is left null in these transactions. paid_id int(11) default null - this field is filled in for charge (chg) transactions with the record id of the matching payment (pay) transaction. When this field is null for a charge transaction, this transaction is outstanding (ie. unpaid). Payment transactions hold the receipt number (obtained from the receiptnumber file in the etc configuration area) in this field. ROA (Received on Account) transactions are generated when the value of the payment is less than the value of the charge transactions. The transaction type (trans_type) of the record is roa. These records have the receipt id value in the description field and paid_id remains NULL until it is included with a payment and linked to a particular charge or charges. id int(11) not null auto_increment - record id for this record. name varchar(16) default null - the short name of the transaction. description varchar(255) default null - a longer description for the transaction. amount double default null - the amount of the transaction. discount double default null - a discount rate (in percent) that could apply to this charge. This is currently unused in any script. tax1_flag char(1) default null, tax2_flag char(1) default null, tax3_flag char(1) default null, tax4_flag char(1) default null - flags to indicate that this tax applies to this charge. A non-null value indicates true (normally a one (1) is stored). group_name varchar(32) default null - the name of the group that these charges apply to. This may be Grade or homeroom. group_value varchar(255) default null - the value of the grouping. If for a grade this might be a 10 or if a homeroom is might be a value like 2RR. The last two fields indicate to which students this charge would apply (although this can be changed when applying the charge). Assess Fees (assessfees.pl) - is used to charge fees to particular students or student groups. The fees can either be predefined fees or created from scratch. The fees are then applied to particular student groups. View Assess Fees (assessview.pl) - provides a simple view of all transactions in the fees_jrl table. The script just does a dump of all records. Delete Fees (assessdeled.pl) - delete assessed fees (ie. charges) that are not yet paid. Change Paid Status (changepaid.pl) - allows lunch fees to be marked as paid. An interim script only until summary lunch values can be posted into the fees system. Export Monthly Summary (exportmonthjrl.pl) - export summary transactions for a month into an external accounting system (csv format). Print Outstanding Invoices (invoice.pl) - used to print invoices for parents of amounts owing, payments made, etc. Only prints outstanding invoices. needs dimension updating for pdf generation. Payments (payment.pl) - add payments and print receipts. Add Predefined Fees (predefadd.pl) - add predefined fees. View Predefined Fees (predefview.pl) - view all predefined fees, the amounts, and who they apply to. Print Receipts (receipt.pl) - print receipts (also called directly from payments). transactview.pl - show transactions for a certain student number. rptpaid.pl - same as rptoutstanding. Script is incomplete. Not linked to main page. changepaid.pl - change value of the paid field (ie. indicate paid). lunchadd.pl - add lunch entries for students or student groups (to indicate that they had a particular meal) for a particular date and also indicate whether paid, etc. lunchrpt.pl - a lunch attendance form report; prints a blank lunch entry form for use by lunch room staff. lunchrptdue.pl - a lunch report show fees owing; not used. lunchsearch.pl - name based lunch search with html output. Shows all lunch records (paid or unpaid). lunchview.pl - view lunch records, including ability to delete. A system for managing locks and lockers. lockeradd.pl - add lockers to the system. lockerassign.pl - assign lockers to students. lockeredit.pl - edit locker values. lockersearch.pl - search for lockers based on criteria. 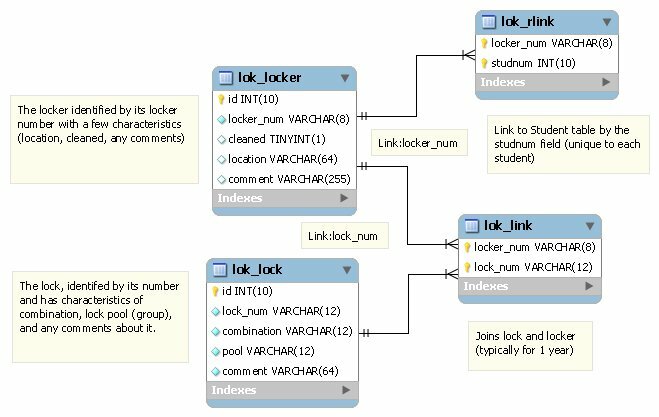 lockerview.pl - view locker values. rptlocker.pl - full locker report. lock_upload.pl - upload locks into the system (from csv file). lockadd.pl - add locks into the system. lockassign.pl - assign locks to lockers. lockedit.pl - edit lock values. lockview.pl - view lock values. These are called from the locker area of the fees page. The eval table - (or evaluation table) stores the teacher evaluations for a student in a particular class and section. When a student is enrolled, one record is entered for each reporting period in that class and section. For example, if there are 4 reporting periods (terms) for a particular subject/section, then 4 records are added for each student enrolled in that subject/section. This table stores not only the evaluation results but also the subject enrollment. When a student has records here, he/she is enrolled. The teacher is the userid and name of the teacher. This course will be listed under the teacher's name on the staff mark entry pages while entering evaluations. The name part will be removed in the future, since this is a design flaw. It will exactly match the userid from the staff table in the future. The paa modules are course ``sub-components'' listed by Saskatchewan Learning. They only have meaning in Saskatchewan, and information from this field is not currently used by other parts of the admin system. The type is an attempt to classify subjects on the basis of the kinds of entry values needed for evaluation. However, as of 2.00, you may leave this field blank. The sequence is a number that controls the order with which this subject prints on a report card. If, for example, you wanted particular core subjects listed first, they would have lower numbers. It is suggested that one go up by tens (10,20,30) when entering sequence numbers to simplify the process of re-ordering subjects or adding in new ones. The web visible field controls whether this subject could be visible on the web to authorized individuals (ie. Parents). This would, of course, mean only their own child and not all students taking the class. This is used by the administration software as of OA 1.50. The faculty field lists which faculty offers this subject. It will help classify subjects for academic requirements. Currently unused. The location field lists where this subject/section is offered. Currently unused, although this will change in the 2.x series. The mark scheme is a text block that describes the evaluation process used by this subject. Currently unused. The 20 objectives fields describe different particular objectives, etc. that a teacher is using to evaluate his/her course. These will be printed on the report cards (normally on the administrative site) and are also present when entering student evaluations (on the teacher site). Normally the first objective field is used for numeric results, and later ones, if used, are more descriptive. The subject aliases are small numbers that uniquely identify a subject/section and are used only for doing particular types of subject based attendance. emptymarksview.pl - View students with missing mark values. This is done before printing report cards so teachers may be notified about missing values. enroladdall.pl - add subject enrollments (ie. enrol students in subjects). This is the main script to do this. enrolstudview.pl - search for subject enrollments by student name, initials. enrolview.pl - view subject enrollment by student or subject. evaldeled.pl - edit/delete subject enrollments. evalmove.pl - move subject enrollments from one homeroom to another; must be same grade and same subjects. rptemptysubjlist.pl - pdf report of student without any subject enrollments. Older code; limited usage, imo. rptenrolgrade.pl - very simple older script; shows enrollment and each term record. rptenrolsumm.pl - from 'Enrollment Summary - Web' button. Shows subjects enrolled and the number of students. Also shows those subjects with no enrollment. rptrank.pl - 'rank students by gpa' button. Select by grade/homeroom and school year. html output. rptrepcard.pl - main report card and alternate report card printing script. Many options on the start page; it also pulls values from the repcard.conf file. rptstudfinalmarks.pl - 'Year End - Student Summary Marks' button. Needs updating to latest configuration values for pdf output. Start page has student selection, sort order, paper size, etc. Title is 'Cumulative Mark Report', and show school year, printing date, and then all the final marks. rptsummark0.pl, rptsummark1.pl - 'View Subject Marks' button; first script selects by grade, teacher, or subjects, and second generates the report (pdf format) with slanted objectives, etc. rptsummarkend.pl - 'Year End - Final Evaluation Report' button; select by grade or homeroom (and paper size). Prints all subjects and all students on a single page with only the first objective (ie. the mark value). Should be updated for pdf setting values. rptsummarkstud.pl - 'Student Term Marks Report' button. Title called 'Student Summary Marks'. Needs PDF update and title fix. Quite simple report. rptsummxtab.pl - 'View Crosstab of Subject Marks' button; title still called 'Summary Mark Report'. Has a start page for values. Can select by grade, homeroom or subject. Then papersize and term (blank=current). Has a report with slanted objectives and includes all objectives for all subjects for all students. This is normally landscape orientation. saliasdel.pl - Not used or linked from html pages. Student Alias delete. saliasupd.pl - Not used or linked from html pages. Student Alias update. saliasview.pl - Not used or linked from html pages. Student Alias view. subjadd.pl - add new subjects. subjdel.pl - delete subjects; called by subjdeled.pl. subjed.pl - edit subjects; called by subjdeled.pl. subjview.pl - view subjects; provides links to edit subject. rptsubjteach.pl - title: 'Teacher Subject Report'. HTML report showing teacher loads. termed.pl - Edit current term. This controls mark entry on the teacher site and posting from the gradebook, as well. A zero value disables. It also changes based on the multitrack variable, since there may be different values of term for different grade levels. The transcript system is designed to store student course information over multi-year time periods while the student is enrolled in school (and even after he/she has graduated or withdrawn/moved). tscriptident - this table stores the basic identity information about the student. There is only one of these records for each student. id int(11) not null auto_increment - normal id field to identify the record. studnum int(11) default null - the student number used to link this record to all of his/her course information records stored in the other table (tscriptdata). This field must be unique to this student since this is the most important number identifying the student in OA. This is the same field as found in all demographic, attendance, report card information, etc. lastname char(40) default null - family name of student. firstname char(40) default null - given name. middlename char(40) default null - other name information. birthdate date default null - birthdate, another key identifying piece of information. studentid char(32) default null - another identifying number; characteristic of the educational jurisdiction. In Saskatchewan, this would be the provincial student number. The field that is exported from the student demographics table (student) and placed in this field is a configured item found in the transcript.conf configuration file. Other fields could be easily added to this table to store other information that is required about the student over the longer term (ie. perhaps other important number such as SSN (Social Security Number), etc. tscriptdata - This table stores the actual course information. This information is read (along with the identity information) to create the student transcripts. id int(11) not null auto_increment - record identifier. 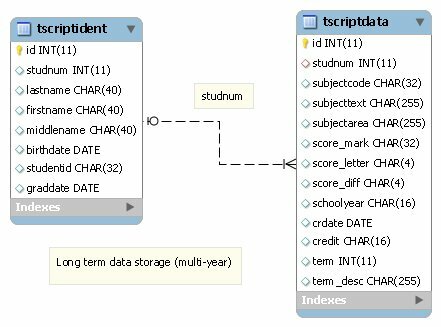 studnum int(11) default null - links to the student identity table (tscriptident) in a one to many relationship. (One student - Many Courses, possibly). subjectcode char(32) default null - the course code assigned to this subject by the school. 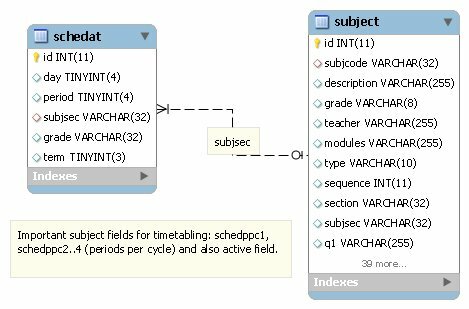 This is called the subjsec (subject-section) code in the subject table and is the subjectcode in the eval table. They are one and the same value. They contain a subject code and a section code separated by a hyphen. subjecttext char(255) default null - description of the subject (ie. Biology 12). subjectarea char(255) default null - the area (science, math, etc.) of the course. score_mark char(32) default null - the student's mark. score_letter char(4) default null - the letter score for this mark. The mapping between a particular mark value and it's matching letter score is found in the transcript.conf file. They letter grades are not stored in the eval table (the table that stores the term results for each student in each course. The final term value is assumed to be the final overall mark. score_diff char(4) default null - a difficulty value for this course. This is used to calculate the grade points for this course. The value is stored in the subject table for this course. crdate date default null - the date of this record. This is credit date; the date this credit was obtained. Currently, not much use if made of this since the school year is more helpful. credit char(16) default null - the credit obtained in this course. Obtained from the subject table record for this course. term int(11) default null - the term of this course. This represents the term of the eval table record that was posted. Not all that useful, except for record ordering of the transcript records (along with the year). term_desc char(255) default null - the description of this term... values are mapped from the transcript.conf so that they describe the school's particular text for this period of time (since terms are smaller than Semesters (2 terms = 1 semester) or Quads (2 terms per quad; 4 quads per school year). There are only a few scripts (3 currently) required to implement this system. As a result, they are all included in the cgi/repcard directory along with the other report card scripts. The scripts themselves should be read to understand their operation. The Transcript Post script (tscpost.pl) - this script copies information from the current year's student evaluation (eval table) into the transcript tables (tscriptdata, tscriptident). It adds a transcript identity record if one doesn't already exist and then adds data records for the subjects selected. It will skip any existing records if they already exist. Existing records can be edited directly. The Transcript Edit/Delete script (tscdeled.pl) - this script allows transcript records to be edited and deleted in the transcript data table. The student information table (tscriptident) is not affected since these records may remain even if there are no matching data records. The Transcript Report script (rpttranscript.pl) - generates the actual PDF transcripts. It generates both an HTML output as well as the PDF output required. tscadd.pl - Add transcript entries. tscpost.pl - Post evaluation entries (ie. report card marks) into the transcript system. pkenroladd.pl - enrol students in the PK subjects. 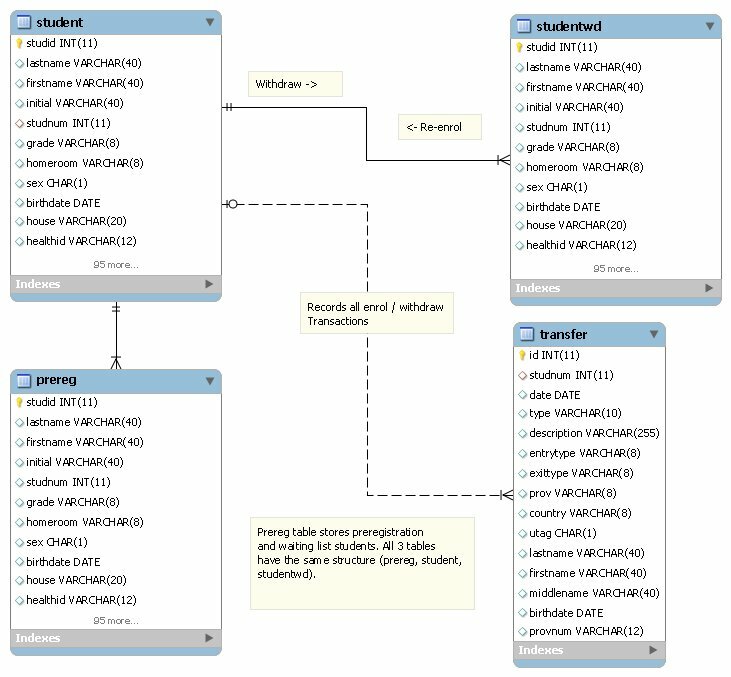 pkenrolview.pl - view subject enrollment in PK subjects. pkobjadd.pl - add objectives to a PK subject. pkobjview.pl - view per PK subject objectives, delete objectives, and add or edit or delete choices for those objectives. pksubjed.pl - lower level PK subject edit; called by pksubjdeled.pl. exportfetdata.pl - export xml data to the FET (Free Evolutionary Timetabler) timetable software. importfetdata.pl - import xml data from FET. schedadd.pl - add timetable elements. schedel.pl - delete timetable elements. schedit.pl - edit timetables elements. tchschedview.pl - view teacher timetable. 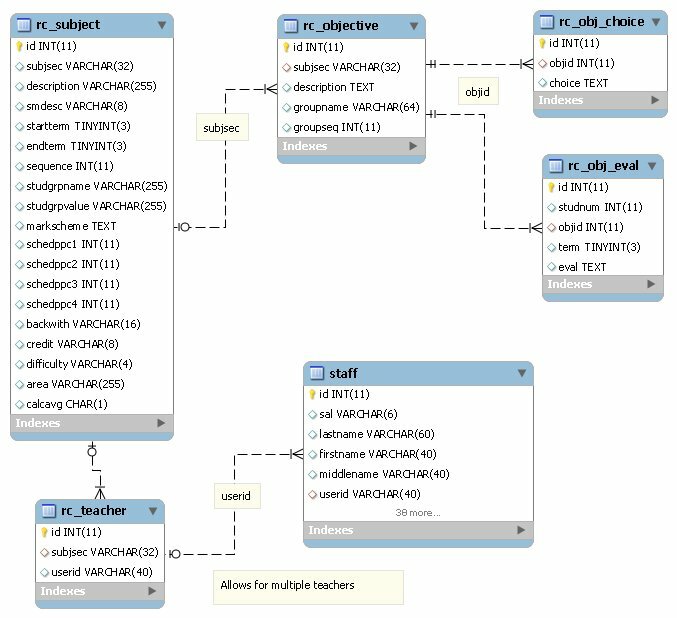 Subject scheduling scripts that edit data for FET timetabler use. subjsched.pl - Add/Edit Subject Periods per cycle and active or not. Used by timetabler to generate timetable based on constraints. Scripts for this system are located in /cgi/fees also. transdaily.pl - Daily transportation report, includes attendance. transedall.pl - Edit all transportation values. transrpt.pl - Transportation report (pdf) - not yet templated. transview.pl - View Transportation fields. wheresnelson.pl - based on the children's book 'Where's Miss Nelson', this script gives teacher location based on their entered timetable. whereswaldo.pl - similarly, from the 'Where's Waldo' children book, this gives student location based on timetable. backupall.pl - full database backup for download. expaddress.pl - export student and address information. expcumfldr.pl - export fields needed by the cumulative folder. expcustom.pl - export any selected fields. expphoto.pl - export information for school pictures. exprepcard.pl - export report card data. expstaff.pl - export staff data. expstud.pl - export full student data. 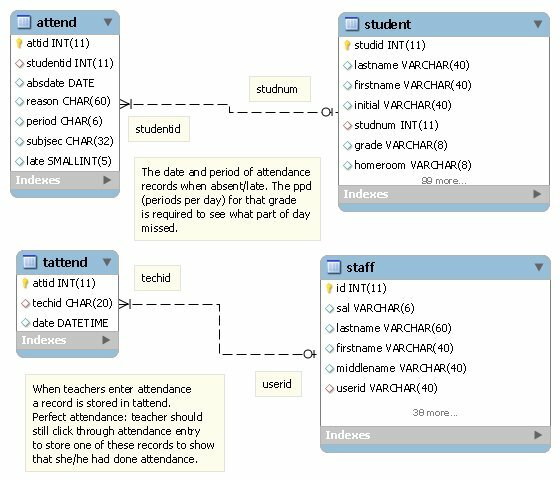 expstudent.pl - export selected student data. expuserpwd.pl - export users and passwords. expwdstud.pl - export withdrawn students. associate.pl - this script will change the filename into a student number value (since the correct name is studentnumber.jpg (ie. 12345.jpg). It also updates the student pic field. imageadd.pl - upload image files (even in zip or tgz archives), extract, and resize into working directory for pictures. They should then be 'associated' to rename to correct student number value. imageview.pl - view and delete student images. rptpicstudent1.pl - new report for student pictures. pdf output suitable for color laser printing. studpicview.pl - another student picture viewer. Different options. Register kindergarten(K) and prekindergarten(PK) students before the end of the current school year. Want to do homeroom and grade assignments before school end. prereg - a clone of the student table. Preregistration entries (ie. K, PK) are stored here and then added to the student table later. preset - updated values for homeroom and grade for students that will be used to update the student table later. prestaff - clone of the teacher table. Stores new teaching homeroom assignments, etc. for pre-registration reports. This is used to replace the teacher table in the new year. asclass.pl - assign student homerooms (preregistration) in prereg. copybackstaff.pl - copy prereg staff tables back into normal staff tables. Current staff values are removed. copystaff.pl - copy the staff ( staff, staff_multi) tables into the prereg staff tables ( prereg_staff, prereg_staff_multi ). premptyclasslist.pl - older custom classlist report pointed at the preregistration student table. This should be replaced with the custom classlist report being able to accept table input. preregempty.pl - simple script to delete prereg student table (with confirmation). preupdateroom.pl - update the normal student table grade and homeroom values from the student preset table, which basically carries the homeroom and grade. prexfer.pl - selectively move preregistered students into the normal student table. ( prereg to student ). promote.pl - empty the preset table. Then add new records with incremented grades into preset. Also include students in prereg, without grade change. prstudview.pl - an old prereg (student) viewer. Should be updated or use new student viewer pointed at this table. prstudview1.pl - a preset table viewer to show homeroom and grade assigned. 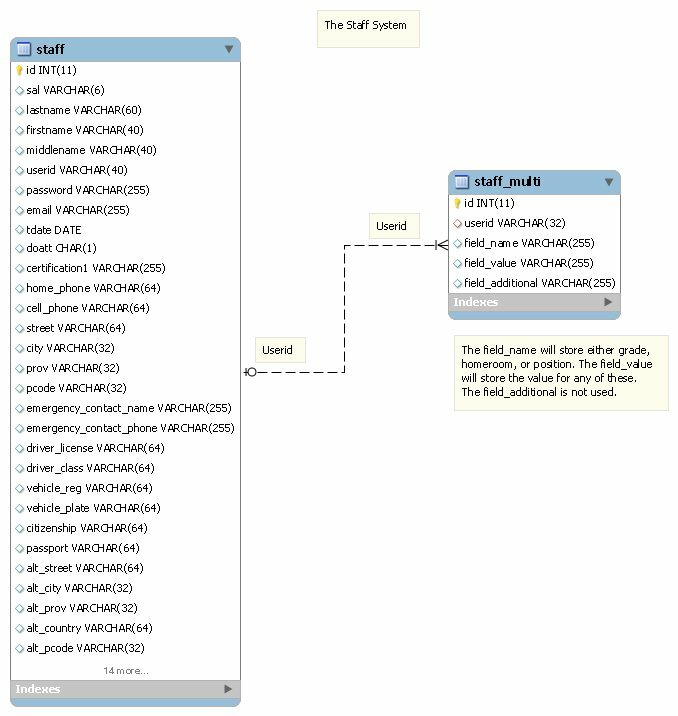 This system includes the 2 tables above (staff, and staff_multi) linked with the common userid field (which also links the staff to other tables such as the subject table in the report card system, etc. This system is supported by the meta system and both editing and reports are generated using templates. The scripts, located in /cgi/staff, are used to add, edit, and report on staffs. The staff report is template based and can load multiple formats. staffadd.pl - Add new staff members. staffrpt.pl - Staff report, based on various templates; pdf output. staffview.pl - Simple staff viewer with most common fields. The dates table is used to store dates for the school year. They indicate days (Monday - Friday) that school is not in session due to statutory holidays, school holidays, inservice, etc. This is required to correctly calculate student attendance since OA only tracks days that students are away, not present. dateadd.pl - add dates to the school year. dated.pl - edit school dates. datedeled.pl - edit/delete schoold dates. dateview.pl - view school dates (and other date configuration in conf files. The metadata system allows us to provide metadata (data about data) about values in fields of tables. 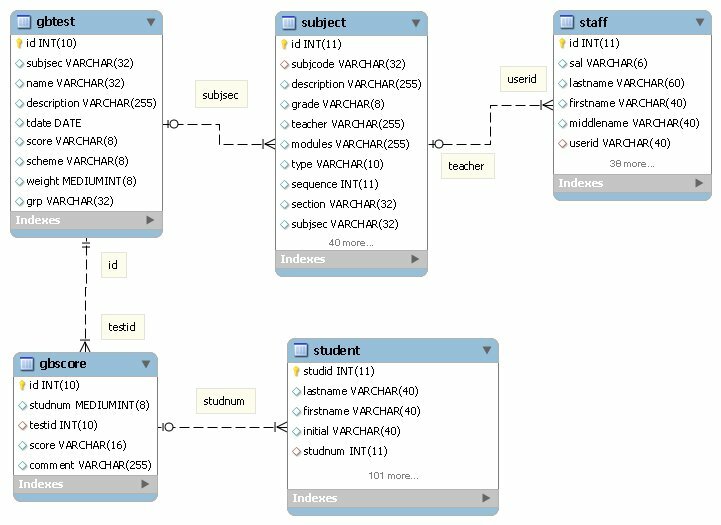 Currently this supports the student tables (student, studentwd, prereg), the staff tables ( staff, staff_multi), and also the student_inac tables (used in Canada for First Nations schools). The meta table provides information about each field in those tables including, text name (supporting translation), default values, type of edit form used ( plus other edit characteristics ) and whether a required field during entry. There is a libmeta library function in the lib folder. It provides the metaInputField function to provide entry form values 'around' the staff or student fields (identified by the fieldid). Read the template into a text variable. Templates are stored in the templates folder at the same level as the cgi, etc, admin folders and have a filename .tpl extension. Read in the field values for the table of interest from the meta table. This includes the fieldid and the fieldname (which may be a translated value updated by the translation system). These are loaded into a hash to make it easy to lookup a fieldname based on a fieldid in the template. Replace fieldid's in the template text (identified by *field* values where 'field' is the fieldid ) with the fieldnames loaded from meta table. Next load record values (if any) into a hash indexed also by fieldid (which is the name of the field in the table). Then use a regex expression to search the template for any fieldid of the form @field@ and replace those values with the value from the staff or student table. This will allow us to display the names and values of a particular student or staff record. If there is a desire to edit values, then use the metaInputField function in a form. Use the same search and replace method to return form elements (with embedded value) into the form text. If this is a addition operation rather than an edit operation, there are no existing values. As a result, there is no need have a read values step and nothing is passed to metaInputField for the value. Here is some example code from the inacadd.pl script for an edit operation. A display only operation does not require the metaInputField loop. # Get fieldnames from meta, store in hash. # Formtext is now ready for multiple use; only contains <@fieldid@> values. # Get their record, if any. 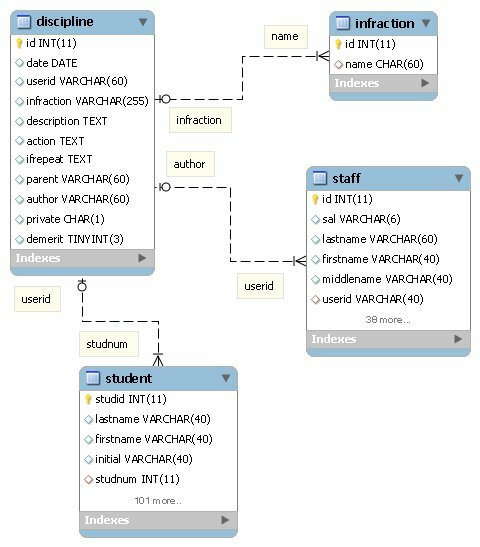 metaedit.pl - edit metadata for student and staff. metaupdate.pl - synchronize meta table values with underlying data (ie. student, staff) tables. fixCaseDup.pl - finds phrases with duplication, differing only in case. Doesn't really fix anything, just displays. Not linked to translation on eoy page. xlatRemoveDup.pl - this script does remove duplicate phrases. Not linked to eoy page. xlatExportPO.pl - export phrases into a .PO file. The start page gives a choice of phrases and translation. These come out of the xlat_lang table. xlatImportPO.pl - upload a .po file containing phrase translations into the xlat_lang table (translation) and also xlat_phrase if required (with options). xlatExtract.pl - read scripts, html templates, and metadata (table) and generate a list of all phrases from the lex hashes. These are placed in the xlat_phrase table. xlatInsert.pl - will insert translations (from xlat_lang table) into the lex hashes in the scripts, rewrite the html pages from the html templates (with translation), and also update the meta table fieldname values. 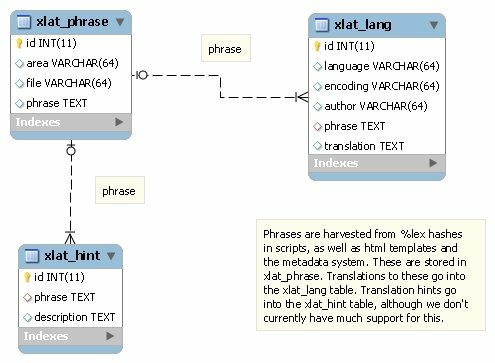 xlatPhraseView.pl - view phrases and translations from the xlat_lang and xlat_phrase table. xlatTransEdit.pl - Edit translation phrases. addexternal.pl - copy user information (staff and student) onto an external server. Cron scripts on the external server will compare this file with existing users and add any missing ones. resetexternal.pl - copy a reset file to the external server to change password or lock the account (or the reverse). gdocview.pl - View Google Users in your educational domain, and compares them to existing local records. googleupdate.pl - Manage Student and Staff accounts on Google domain. googleview.pl - Simpler Google Viewer than gdocview. Only shows name. ldapmanage.pl - fill missing ldap values in the OA student and staff tables, so this can then be synchronized with ldap directory. File upload is not yet supported, but in the cards. resetldap.pl - reset passwords and user accounts in the ldap directory. syncstaff.pl - synchronize OA staff and the ldap directory. syncstudent.pl - synchronize OA students and the ldap directory. viewldap.pl - view the ldap directory and values. Basically an ldap dump. Not linked to the main page, so a blind url. importstudentdbf.pl - Import students from SIRS3 dbf upload. importhomelogicpassword.pl - Import the passwords (stored in homelogic module) of SIRS. This is an additional table and scripts addon to the student demographics system. It provides the data required to print INAC reports such as the nominal roll. 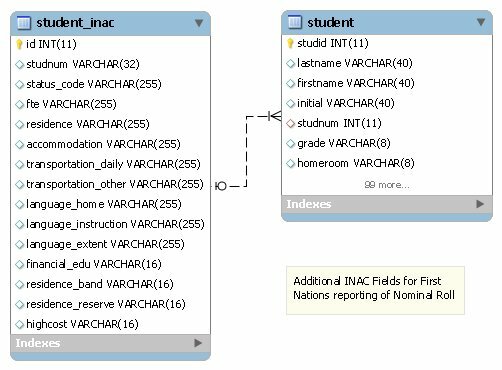 inacadd.pl - add inac fields to the new student_inac table. Additional fields are required for the inac nominal roll forms. inacdeled.pl - normal edit/delete script for these values. rptinacconf.pl - inac confirmation report (html). rptinacroll.pl - inac nominal roll report (pdf). gbscore - holds individual student scores for a particular test / assessment item. gbtest - holds information about each test/assessment item for all subjects.